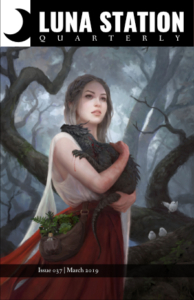 As sff fans, I’m sure most of you dear readers have been to at least one con before. Admittedly, I’ve never been to a comic-con, but I have been to the Boston Book Festival a few times. There’s always so much to see and do there, but priority was always going to whatever YA panels they had scheduled which, when compared to the other events, were few and far between. 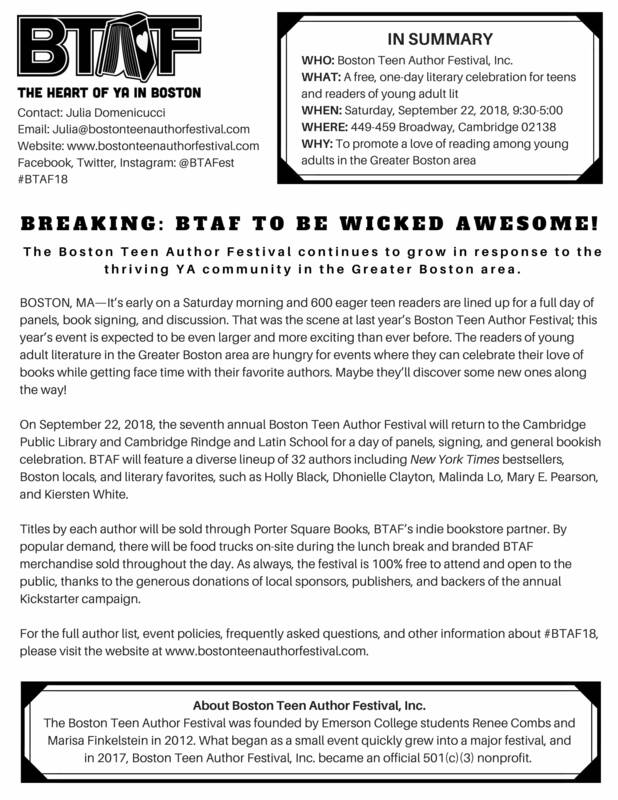 So imagine my delight when I discovered there was another book festival in Boston that was specifically catered to YA. Yes, such a thing exists! 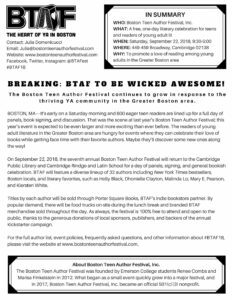 The Boston Teen Author Festival, held for its seventh year at the Cambridge Public Library, is taking place this year on September 22nd. They have an incredible lineup, including some of my personal favorite authors, Holly Black and Julie C. Dao. I’ve always had a great time there in the past, and this year’s festival is looking to be the best one yet! So get hyped, my fellow YA fans, because I’ve procured an interview with festival director and president Renee Combs. How did the BTAF start? Renee: The Boston Teen Author Festival began in 2012 at Emerson College to fill what we saw as a gap in the Boston book scene. This city is full of literary history, but there weren’t a ton of YA events going on at the time. If we wanted them that badly, surely others did as well! So we decided to bring the authors to us and thus BTAF was born. YA tends to be snubbed by the literary world. What does YA mean to you, and why do you think it deserves its own festival? Renee: I read YA growing up and continue to find my favorite books there. I think people can see a young narrator and expect the story to have less depth or maturity, but I’ve found it to be the opposite. Teens feel so strongly, something I think a lot of us lose as we age, and those coming-of-age stories can be some of the most poignant. They help people feel less alone, whether it’s a teen reading or an adult. The community has also evolved by leaps and bounds in just the last decade, and we hope that having a festival specifically for YA will help bring that community together to celebrate the books and people we’re all so passionate about. What are you most looking forward to in the festival this year? Renee: We’ve rebranded this year and changed up the schedule, so we’re really excited to see everyone’s reactions to the changes! We also have an amazingly diverse lineup so we hope readers get to meet some favorite authors and discover new ones along the way. In what ways would you like to see the festival grow? Renee: We’re really set on keeping the festival fairly small, especially compared to other events of this nature. We love the fact that readers can interact with authors throughout and that we have a very relaxed, welcoming approach to the day. That said, we’d love to make room for more teens to come from around MA and New England, and to get more involved in the community outside of this single day. It’s important to us to keep teens reading year round and to make sure they’re aware of the amazing titles being released outside of our attending authors. Is there anything else you’d like our readers to know about the BTAF? Renee: We’re still looking for volunteers! We’re always so appreciative of the enthusiasm our volunteers show and can’t wait to work with them again this year. Some of last year’s stand-out volunteers even joined the development team! Those interested can check out the roles and responsibilities on our website.